Saturday, January 21 1:00-3:00 at the South Hall. Please RSVP to register. $15-$25 sliding scale. Did you know that you can grow citrus on Galiano, without a greenhouse or any special equipment? Our increasingly mild winters mean that the list of Mediterranean plants that can survive our winters is growing. Bob and Verna Duncan have dedicated the last twenty years to pushing the envelope on what we can grow in our region. They own a nursery and demonstration orchard in North Saanich, where they grow over 400 varieties of fruit trees, including citrus, olives, avocadoes, figs, olives, and pomegranates. They’re experimenting with exactly which conditions these plants need to thrive, and they travel to the colder regions of Israel, Turkey and Greece to learn what local farmers there are doing. They have brought back hardy varieties and cultivated them here, so they have plant varietals that are most likely to succeed in our conditions. Bob trained as a botanist and entomologist and worked with the Canadian Forest Service. But it’s the citrus that gets me really excited. 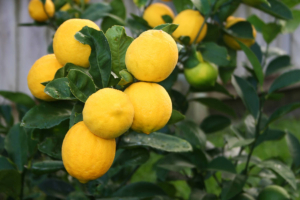 Available from their nursery are Meyer lemons, oranges, limes, grapefruit, variegated Pink Lemons, yuzu, kumquats, and sudachi. While some of these do need a greenhouse, the lemons, limes and sour oranges are hardy enough to survive our winters along the south wall of a building with a bit of floating row cover to trap the heat and a string of Christmas lights on the coldest days. The yuzu, a fragrant Japanese lemon, is especially cold-hardy. And citrus ripens through the winter, when fresh, ultra-local, pesticide-free fruit at the peak of ripeness is a real treat. The Food Program is hosting Bob and Verna for a presentation in January – join us to learn all about cultural requirements and variety selection for success in growing citrus & sub-tropical fruit trees (such as avocado, pineapple guava/feijoa, pomegranates, and loquats) in South Coastal BC. And next time you are in Victoria visit, visit Fruit Trees and More, just a 5-minute drive from Swartz Bay, and see what Bob and Verna have done on a third-acre suburban lot. It really has to be seen to be believed. See http://www.fruittreesandmore.com for more info.